Everyone, having in its arsenal, at least a few gold or silver jewelry, He knows, what a pleasure to bring their own eyes their brilliance and beauty. But sooner or later there may come a situation, what's hot favorite jewelry will gradually darken and lose their original luster. 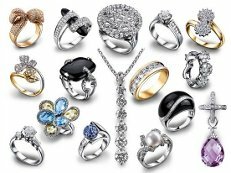 The reasons for this phenomenon can be varied, from improper storage of jewelry and ending with health problems of their owner. However, do not worry and panic ahead of time at the sight of one of the blackened area decorations. Until a few decades ago, craftsmen were "invented" methods of cleaning silver at home, and carefully handed down from generation to generation, they came up to the modern age. So, if on 10-15 minutes omit blackened silver product in 10% ammonia solution, then after a couple of minutes to watch, as a decoration on the black starts to dissolve. At the same time, should remember, if on silver are artificial or natural stones, the ammonia solution is to do a little bit at a concentration. Another "chemical" method is the use of sulfuric acid, that can "get" from the spent battery. Silver decoration must first boiled in a 10% solution of sulfuric acid, and then just rinse it in warm water jet. 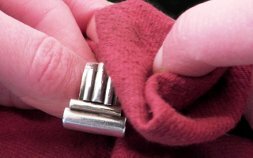 Let's look at "cooking" methods of cleaning silver. Improvised, which are always present in the kitchen of every housewife, you can use citric acid and baking soda. In the first case silver decoration placed in citric acid and water solution, which is heated for a few minutes in a water bath. The second case is almost similar to the first with a single supplement - to the "composition" of boiling, you must add a piece of foil for roasting. After all these shiny silverware procedures need to be removed from solution and rinsed in a stream of running water. no less common method of cleaning products is blackened silver and conventional stationery eraser, which decoration you simply rub to a shine. The only limitation for this procedure is "tortuosity" and the complexity of the decorations, which will not allow to get an eraser to the most hidden corners of the product. Nor should we forget the salt, vinegar, toothpaste, which also tend to remove the black spots with silver jewelry. There is also an opinion, and that, that the boiling of silverware in the popular drink "Coca-Cola" also lead to the desired result. At the same time on the TV screen repeatedly to see and suggestions on chemical means to remove the blackened areas, the effect of which, as practice shows, somewhat exaggerated, than it actually is. Anyway, that for a long time to enjoy the beautiful silverware, you need to understand, that should take care of them every day and every hour, cleaning methods apply silver or neglect Simple Tips for their operation.